PPP’s newest national poll finds that Donald Trump is losing all of his fights with the media- and voters really think he needs to reduce his cable news consumption. 62% of voters nationally think Trump should keep his cable watching to less than an hour a day, and 82% think he needs to keep it under 2 hours a day. Just 6% of voters in the country think it’s a good idea for Trump to spend more than 2 hours a day watching cable news. Last week Trump declared that the news media was the ‘enemy of the American people’ but we find that only 35% of voters believe that, to 53% who say that isn’t the case. By a 48/44 spread they say it is actually Trump who is the greater threat to the American people than the media. We asked voters who they thought had more credibility between Trump and each of the outlets he singled out for attack last week, and Trump loses out to every one of them by double digits. They put up various media outlets in head to head polls against Donald Trump. The New York Time came out the best, beating Trump by a 52 to 40 percent margin. NBC, CNN, ABC, and CBS came out just slightly less well, beating Trump by ten to eleven points. They also reported that, “We also in general find that voters find the media outlets Trump considers hostile to him credible, while it finds the outlets more friendly to him less credible.” They compared the number seeing each media outlet as credible versus not credible and reported net credibility. The New York Times and the major network news had net credibility ranging from 19 to 25. CNN lagged behind at 15 but still was seen far better than Fox, which had a positive net credibility at 6. Daily Caller, Info Wars and Breitbart had negative net credibility ranging from negative 31 to negative 36. To a pollster’s mind this would be a big victory, but we are not looking at general election polling. In a general election, a win of ten points or more would be a landslide. While we saw how a three point victory was not enough for Clinton to win in the Electoral College, there is no question she would have had a large victory in the electoral college if she could have achieved a ten point victory. However, this is not a general election poll. I still find it discouraging that in a question of who is more credible, Donald Trump, who has lied every day since taking office, is seen as more credible than major media outlets by forty percent of those polled. At least the more mainstream media was seen as more credible than the right wing sources which do intentionally spread misinformation. 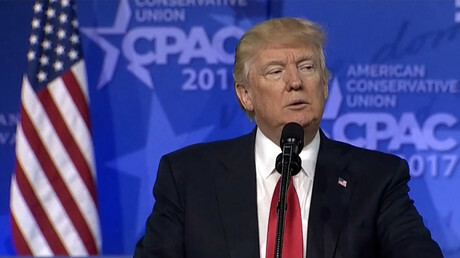 Donald Trump has received considerable well-deserved criticism for his attacks on the news media, including calling the media the”enemy of the American people.” Trump continued to attack the media at CPAC today, including a threat that “we’re going to do something about it.” He claimed that he was only attacking “fake” news, but his attacks have included many mainstream media outlets. He bases his attacks on coverage which is negative towards him as opposed to opposing news which is actually fake.